A smoothie I came up with recently that has become my go-to smoothie for myself & toddler. Full of superfoods & a way to get some greens in her diet! I love acai bowls but they always seem to have too much sugar. But did you know acai is actually a berry with no sugar naturally!?! Unsweetened acai is an amazing super food. Sweeten the smoothie with the natural sugars from a banana and ta da! A guilt-free smoothie! Run Trader Joe’s or Samabazon Unsweetened Frozen Acai Packets under warm water for 30 seconds. Throw all ingredients to a blender. Blend! Drink as a smoothie or eat as a bowl. 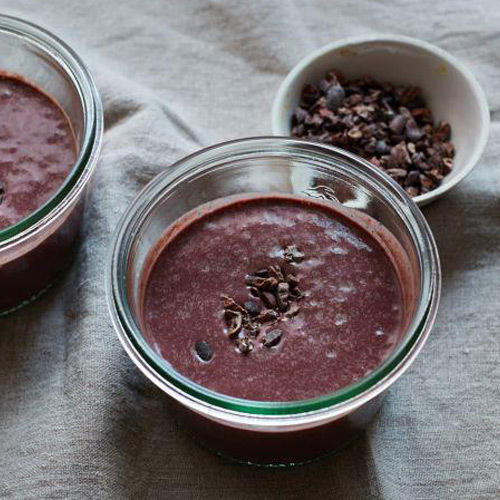 Top with raw cacao nibs or bee pollen.